Is your garden in need of a little patriotic magic. 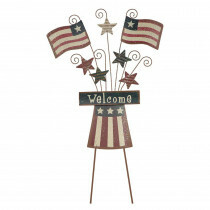 This handcrafted iron yard stake is ready to welcome your guests, true American style. Give your yard that special touch.